July 14, 2018 • 7:10 p.m. • Whiting, Ind. 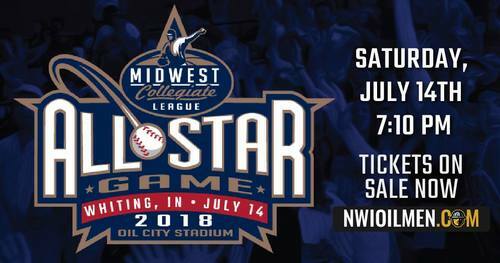 The Midwest Collegiate League’s brightest stars will be on display on Saturday at Oil City Stadium as they take the field on the league’s biggest stage. The annual All-Star Game serves as a chance for the league to further its mission of developing players who are ready to play at the professional level. Now in its ninth year in existence, the MCL has accomplished its goal of aiding collegiate ballplayers in their climb to the professional ranks. The league has had countless players go on to play professionally and two reach the ultimate dream – Paul DeJong of the St. Louis Cardinals and Tony Cingrani of the Los Angeles Dodgers. DeJong, a former member of the DuPage County Hounds, is the MCL All-Star Game’s most notable alum. He played in the event in 2013 as his North All-Stars fell 12-4 to the South All-Stars at Oil City Stadium. The current St. Louis Cardinal batted .285 with 25 home runs and 65 RBIs as a rookie last season, finishing as the runner-up in the 2017 National League Rookie of the Year balloting behind Cody Bellinger of the Los Angeles Dodgers. This year, the MCL West All-Stars roster will be comprised of players from the DuPage County Hounds, Joliet Generals and Bloomington Bobcats. The East All-Stars will be made up of the Northwest Indiana Oilmen, Southland Vikings and Crestwood Panthers. Two 2018 MLB draft selections will play for the East All-Stars on Saturday night as Jake Plastiak and Zaid Walker of the Northwest Indiana Oilmen take the diamond. Walker was selected by the Cincinnati Reds in the 36th round, while Plastiak was a 28th-round selection of the San Diego Padres. Bobcats skipper Jake Wegner will guide the West squad, while Southland’s Dave Letourneau has been named manager of the East team. The DuPage County Hounds find themselves with a two-game lead over the Southland Vikings for the top spot in the Midwest Collegiate League. The Northwest Indiana Oilmen are four games off the pace set by DuPage County and two games behind the Vikings for second place, which carries with it the right to host Games 1 and 3 of a first-round playoff series. Bloomington and Joliet are duking it out for the fourth and final playoff spot, as the two teams enter the stretch run tied, both eight games behind the first-place Hounds. The top four teams advance to the MCL Postseason, which features best-of-three semifinal and championship rounds. The Southland Vikings are the defending league champions and have won the most titles of any team in the league with three. The first MCL All-Star Game was held at Oil City Stadium in 2011, the year before the Oilmen entered the MCL. A sizeable crowd in Northwest Indiana was treated to an entertaining affair, as the South beat the North 8-7 in extra innings. The 2012 game was held at Benedictine Stadium, but since then Saturday will mark the sixth straight and seventh overall at Oil City Stadium. Paul DeJong of the St. Louis Cardinals played in the 2013 MCL All-Star Game and was one of six players who competed in that game to go on and play professionally. Last year, the MCL fielded one All-Star team, which took down the Serbian National Team 14-3.